New guidelines for clinicians could lead to better diagnosis and treatment of congenital hearing loss. By the time Paula Rosenthal and her husband realized their daughter had congenital hearing loss, Julie was 17 months old—and already behind most children in developing language skills. Worse still, she was already too old for corrective surgery. Both Paula and her husband have forms of hearing loss, which put Julie at high risk for her disorder—one that affects about six in every 1,000 newborns. But their pediatrician didn’t know that genetic tests for newborns were available that could have caught Julie’s condition early enough for therapy. “She was fitted with hearing aids a week before her second birthday,” Paula said. New recommendations (called “fact sheets”) for newborn screening, recently approved by a committee of the American Academy of Pediatrics, could now help babies in Julie’s position. These fact sheets, which were originally issued in 1996, call for clinicians to screen newborns for a dozen different genetic diseases. Recent advances in technology have made genetic diseases like congenital hearing loss both easier to diagnose and easier to treat. The 2006 fact sheets went to physicians and hospitals beginning in September. 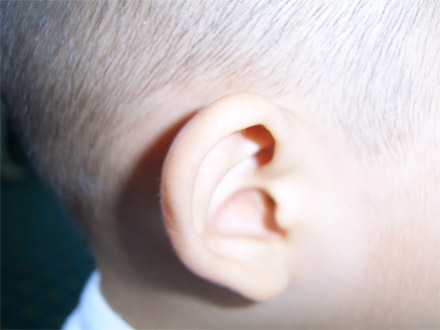 If a doctor is able to diagnose hearing loss before an infant reaches six months of age, the child can develop normal language skills through speech therapy, according to the National Institutes of Health. The new guidelines recommend that doctors use an otoacoustic emission test, in which a probe sends a sound wave into the baby’s ear. By measuring the way the sound wave bounces off the ear drum, doctors can determine if a baby has congenital hearing loss. “[The test] makes a lot of sense,” said Joan Besing, a clinical audiologist at St. Joseph’s Hospital in Patterson, New Jersey, who said the new tests are very sensitive and very useful. “It’ll help to identify these kids a lot sooner,” she added. The tests recommended in the updated fact sheets are possible because of the development of a technique called tandem mass spectrometry (TMS), which breaks down the compounds in a blood sample and sorts them by common characteristics at the molecular level, allowing clinicians to test for a variety of diseases with a single sample. “With the advent of tandem mass spectrometry, it becomes easy to screen for a whole bunch of diseases we couldn’t test before,” said Bradley Schaefer, chairperson of the academy’s committee on genetics, which developed the new guidelines. Before TMS was used in genetic screening, a clinician could only screen for between five and eight diseases. Now, they can screen for more than thirty diseases with one small blood sample—all for about $16. For the Rosenthal family, that $16 would have saved a lot of heartache and approximately $18,000 a year. Paula Rosenthal moved from New York to Missouri so Julie could attend a private school specializing in the care of young hearing-impaired children. Her husband, an executive in a family business in Astoria, remained in New York for three years to continue working to fund this special treatment, which was not covered by their insurance. “It is imperative for doctors to be informed about the available resources for families,” Paula said, in the hopes that future patients will receive better healthcare sooner. “You’ll find I’m full of surprises.” Through Scienceline, Ben Leach hopes that you will discover a side of him that is passionate about reporting on science, especially health and medicine, and interest that stems from his academic, professional, and personal experience. Now that he’s done the obligatory serious stuff, he can mention that he’s also an aspiring playwright, a pop culture addict, and an extremely serious collector of all things, especially toys, related to the 1980’s.